More than 1,000 companies have already confirmed their places at Plast 2015, the Italian plastics and rubber industry trade show, according to the organizer, Promaplast Srl. The triennial Plast 2015 will be held from May 5-9 in Milan, Italy. “In spite of the economic crisis and recession that have struck almost all branches of Italian and international industry, the plastics sector has affirmed its solidity, having already reached the same number of registered exhibitors as in the 2012 edition for the equivalent period,” announced Mario Maggiani, Promaplast Managing Director. He expected more exhibitors and visitors will come to the show due to its concomitance with the opening week of EXPO 2015. Around 20 Chinese companies have directly booked their booth, occupying over 1,000sqm net exhibition space in total. Some 20 more Chinese suppliers will be manufactured by their local agents, according to the organizer. Several new initiatives will be held during Plast 2015, said Promaplast, including the three concurrent shows: Start Plast, 3D Plast and the Rubber satellite show dedicated to this material. Start Plast aims at providing a seedbed for new projects in a venue where all the players necessary for launching a startup can be found. Together with business promoting services provider Comonext, Promaplast will select up to a maximum of 50 startups in the entire plastics industry chain to exhibit at Plast 2015. “Given the way the recession is dragging on and the serious difficulties that continue to plague all of Italian business, including the plastics and rubber industry, we feel it is our duty to find a way to facilitate young entrepreneurs and the companies that represent our future,” said explained Mr Maggiani. Making its debut, 3D Plast is an exhibition area dedicated to additive manufacturing, fast prototyping, design software, 3D printing and related technology. In addition, winners of the Plastic Technologies Award 2015, an international design competition produced by POLI.design, a consortium from the Milan Polytechnic, will be displayed at Plast 2015. 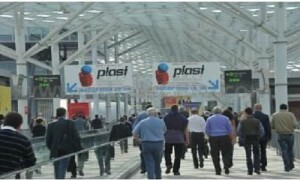 The 2012 edition of Plast had a total of 1,500 exhibitors and 50,000 visitors.